OSWEGO – A crowd of more than 165 gathered in Oswego Veterans’ Memorial park on Sunday afternoon to observe the 100th anniversary of the signing of the Armistice that ended World War I. And, they honored the memory of the many Oswego County veterans who gave the ultimate sacrifice. 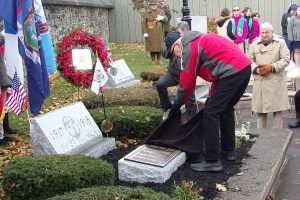 Residents from Oswego County organized the Oswego County World War I 100th Anniversary Commemorative Project to honor and memorialize those from Oswego County who died serving in World War I. They also worked to place an Oswego County commemorative flag at the grave markers of 33 Oswego County World War I service members buried overseas in 11 cemeteries in France, Belgium and England. To see pictures of the flags at the grave markers overseas and to learn more about the project, visit https://www.facebook.com/OswegoWWIVets/. On Sunday, people came from all parts of the county. One woman from Fulton was looking to see if one of her family members, Clarence Delong, was listed. After scanning the names, she saw what she was looking for. Then she saw ‘Lyman Stacy.’ “I think that might be one of my grandfather’s cousins,” she said. At 11 a.m. on the 11th day of the 11th month area churches rang their bells in remembrance. Veterans lowered the flags at the park and retired them until next spring. Volunteers from Fort Ontario, dressed in World War I uniforms, stood at attention next to the monument during the afternoon ceremony. Oswego Girl Scouts from troops 10566 and 10567 acted as flag bearers. And, the Scouts also performed “God Bless America.” Many in the crowd sang along. City Historian Mark Slosek was the MC for the ceremony. He praised Dan Allen who spearheaded the anniversary committee throughout the year for his hard word and dedication to the event. More than 116,000 US troops died. More than 500,000 New Yorkers served and helped secure victory for the Allied Forces. Mayor Billy Barlow recognized the may Port City residents who turned out in the snowy weather for the event. Earlier this year, the city DPW cleaned all of the monuments in Oswego, the mayor said. The area is world-renown for the role it played in the French and Indian War, War of 1812 and for Safe Haven during World War II, Shane Broadwell, chair of the Oswego County Legislature, said. Slosek recounted women from Oswego volunteered for a variety of duties to aid the war effort. And, how many of the entire community and beyond joined together to help the soldiers – including fundraisers to buy packs of cigarettes for the troops. 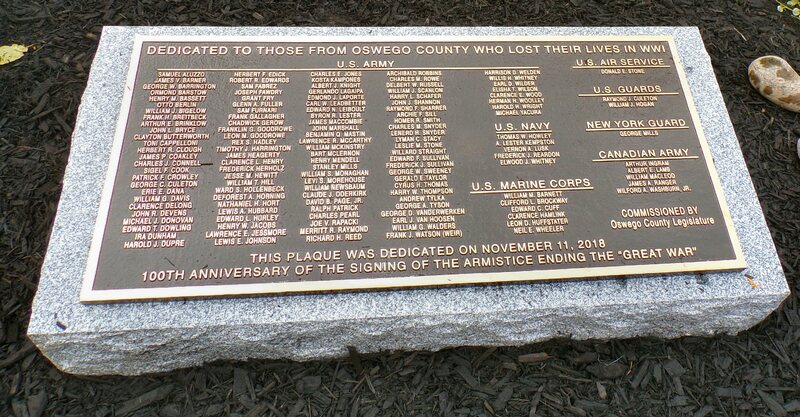 The plaque, bearing the names of Oswego County’s causalities, was unveiled by Paul C. Dehm, a US Navy veteran (Korea) and son of World War I veteran Paul J. Dehm, a wounded soldier awarded the Purple Heart and Taps bugler for memorials of fellow World War I veterans. 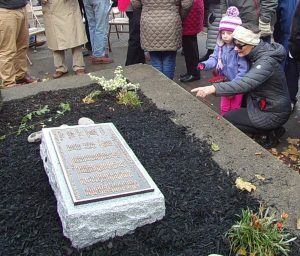 In addition to this county-wide effort, residents, historians and town officials from Scriba recently dedicated a new World War I monument that featured the names of soldiers who were from Scriba.